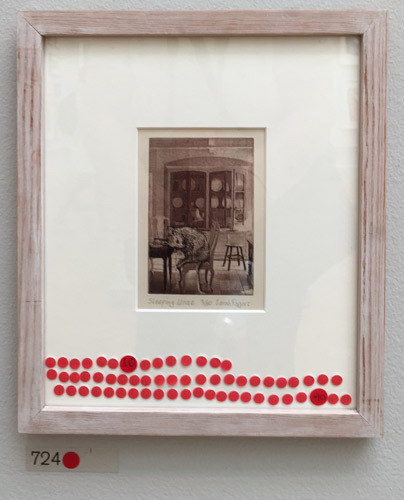 One very small artwork on display at the 2016 Summer Exhibition at the Royal Academy of Arts very neatly illustrates a very important point about pricing for art competitions and the Summer Exhibition in particular. offered some practical advice for artists wanting to work out how to price their artwork when entering a competition. In my past reviews of the Summer Exhibition, I've also repeatedly commented about how the artists who very often do best out of the Summer Exhibition (apart from the RA members) are the printmakers. If you submit a print that appeals and get the pricing right you can very often have a runaway success with the red dots! I spotted a very small print hanging in Room VII of the Summer Exhibition yesterday. It's an etching and chine-collé. It drew my attention because of the number of red spots it had. I counted them at the time and then later went back and took a photograph and counted them again. It's also a completely delightful print and I can well understand why it has appealed to some buyers. However it hasn't just appealed to "some" buyers. It's appealed to an awful lot of them! 78 prints from an edition of 150 have been sold at the Preview Party and towards the end of the first of the RA Friends' Previews. That's one day and an evening. The exhibition doesn't even open to the public until Monday 13th June! The framed print in the exhibition cost £100. Every unframed print from the edition of 150 prints costs £75. £4,165 (net) after commission of 30% (£1,785). I've observed at previous Summer Exhibitions that some prints just seem to provide a trigger for the people who really want to buy something at the exhibition. It's very often a fine art print or a print with a slightly fantasy or comedic edge to it which fulfills this need. It's also very often a print where the artist has created an accessible artwork due to the pricing used for the cost of a print from the edition. this is a print that is priced at the cost of a lunch in this area of town! It all contributes to making this a very easy buy. I imagine the complete edition will be sold out in the next couple of days. That's quite aside from the fact it will have also raised her profile and demand for her prints! Below you can find out more about Sarah Rogers and her printmaking practice. In the meantime anybody who likes etchings of very small field mice should take a look at A Little Bedtime Story and Celebration. Tomorrow I'll be writing up my review of this prestigious exhibition and showing you what I think are 10 artworks I think are well worth seeing. I'll also be commenting more on sales and prices for those interested in the business end of the exhibition! The exhibition opens to the public on Monday 13th June and continues until 21 August in the main Galleries of Burlington House - the home of the Royal Academy of Arts in Piccadilly. graduated with an honours degree in Textile/Fine Art from Goldsmiths College. group exhibitions have included RHA, RA and RUA Annual and Summer Exhibitions, Jerwood Drawing Prize and Eigse. She is a member of the Printmakers Council in the UK and participates in all members’ Exhibitions. This is her Facebook Page - https://www.facebook.com/sarahrogersartist but she's not been active on it since 2013. As an artist I like to use imagery and observations from what I see as the presented, saleable world and re-configure them to a world of experience. My work expresses an atmospheric, gothic world. I’m interested in the obstinate side of life, those moments often hidden. My work is rooted in drawing and observation but I also love found imagery. In their construction, the prints are slightly off beat employing collage and the methods of making reflect the sometimes unusual subject matter I prefer. I did something similar both this year and last year in the Royal Hibernian Academy here in Ireland. Last year I had 2 small ( framed size 20 x20 cm) screen prints accepted for the exhibition. I framed them well, using museum quality glass and put €95 as the price ..the RHA take a lower percentage than the RA. They were both small editions of 10 and sold out at the opening. This year I had two similar pieces accepted and put the prices up to €135 and I've sold 13 so far, though they were hanging in one of the worst places possible in the exhibition. I've also sold quite a number of them from my studio. I felt that, though there would not be a huge profit from them, a good number of people would have my work and more would see them, resulting in more sales directly from me.....which has happened.